Hashimoto’s disease is an autoimmune condition where the body’s immune system attacks the thyroid gland in the neck located just below the Adam’s apple. The thyroid is an essential component of the endocrine system and produces hormones associated with body functions including body temperature, weight, mental cycles and heart rate. The disease causes chronic lymphocytic thyroiditis and inflammation that often results in hypothyroidism, an underactive thyroid gland. In the United States, Hashimoto thyroiditis is a leading cause of hypothyroidism. Inflammation causes damage to the thyroid and reduces its capacity to produce hormones. Approximately 1 to 2 percent of Americans will acquire Hashimoto’s thyroiditis over their lifetime. The disease of mostly affects middle-aged women, but women and men of any age and children can also develop the condition. Anyone on hormone therapy for hypothyroidism due to Hashimoto’s disease should never miss a follow-up visit to the doctor to ensure they are receiving the correct dosage of prescription medication. This is because thyroid function often changes and requires an adjustment in the dosage to ensure proper functioning. Gender – Women have a greater potential of developing Hashimoto’s disease than men and children. Age – Anyone at any age can develop the condition. However, it tends to occur more commonly at middle age, especially in women of middle-age. Heredity – Males and females with a family history of autoimmune diseases and hypothyroidism have a greater potential risk of developing Hashimoto’s disease. Other Autoimmune Diseases – Individuals that already have an autoimmune disease, like Type I diabetes, rheumatoid arthritis or lupus, have an increased potential of developing Hashimoto’s. Exposure to Radiation – Individuals exposed to high levels of environmental radiation and radiation treatments are more likely to develop Hashimoto’s disease. 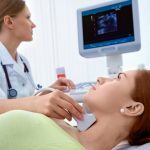 Goiter – Constantly stimulated thyroids typically release higher levels of hormones that could eventually produce a goiter (an enlarged thyroid gland). Usually, the goiter does not cause discomfort. However, it can affect the individual’s appearance and interfere with breathing or swallowing. Heart Issues – Hashimoto’s thyroiditis has been linked with an increased potential of developing heart disease. This is primarily because an underactive thyroid gland often leads to high levels of “bad” LDL (low-density lipoprotein) cholesterol, and if left untreated, can result in an enlarged heart and, potentially, heart failure. Mental Health Problems – One of the earliest indicators of Hashimoto’s disease is depression, which often becomes significantly more severe over time. Men and women suffering from Hashimoto’s also tend to have a diminished libido (low sexual desire) that in time could develop into slowed mental functioning. Myxedema – This Hashimoto’s disease-related long-term condition is rare but life-threatening. Many sufferers of Myxedema also experience drowsiness followed by unconsciousness and lethargy. Birth Defects – Newborns of childbearing women with untreated Hashimoto’s disease-related hypothyroidism usually have a greater potential risk of birth defects compared to newborns of healthy mothers. Statistics have proven that many of the defects associated with untreated hypothyroidism involve intellectual and developmental disabilities. Some scientists believe there is a correlation between hypothyroid pregnancies and birth defects including cleft palate. Because of that, it is essential that women of childbearing age have their thyroid levels checked on a routine basis. Doctors obtaining a family medical history and comducting a comprehensive physical exam will often diagnose Hashimoto’s disease-associated thyroid problems if the patient is feeling increasingly sluggish or tired, experiencing constipation, has a hoarse voice and dry skin, or previously had a goiter or thyroid issues. A Hormone Test – Comprehensive blood tests can help the doctors determine the amounts of hormones that the pituitary gland and thyroid are producing. Underactive thyroids tend to produce low levels of thyroid hormone, whereas elevated levels of TSH can reveal the body’s pituitary gland attempting to stimulate the thyroid gland in an effort to produce higher levels of thyroid hormone. An Antibody Test – Typically, abnormal antibodies are produced when any autoimmune disorder, including Hashimoto’s disease, is present. Extensive blood tests might verify the presence of antibodies and TPO (thyroid peroxidase) antibodies, a thyroid gland enzyme that has a crucial role in producing thyroid hormones. Only recently have physicians been able to detect hypothyroidism (underactive thyroid) to confirm Hashimoto’s disease. Now they can use the sensitive thyroid stimulating hormone (TSH) test initially and follow that test with a thyroid hormone test if required. In addition, these tests help to determine the most effective medication dosage as the disease progresses or gets better. Synthetic Hormones – Many doctors will prescribe the synthetic thyroid hormone levothyroxine (Synthroid, Levoxyl, and others. These medications are synthetic versions the natural hormones produced by the thyroid gland. Dosage Monitoring – Finding the right dose can be crucial to the quality of life the patient experiences. This is because thyroid hormones in excessive amounts can accelerate bone loss, leading to osteoporosis and arrhythmias (heart rhythm disorders). Alternative Medicines – The doctor might also treat the condition with an alternative medicine including porcine (pig) extracts that contain both levothyroxine and triiodothyronine.